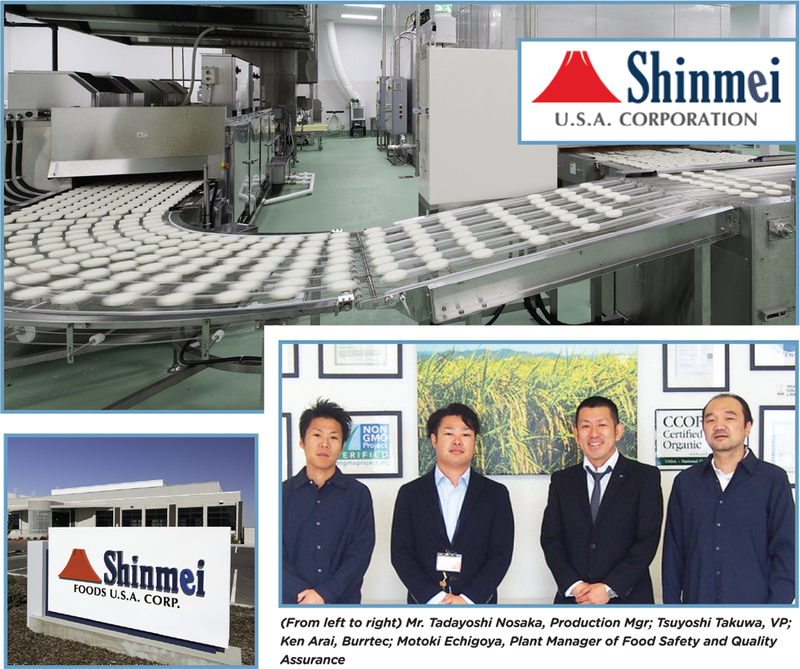 Shinmei Foods U.S.A. was established in August 2015 as an overseas subsidiary of SHINMEI Co., LTD., headquartered in Tokyo, Japan, to manufacture and distribute rice patties from USA to the world. In western countries, wheat-processed and cereals have been mainstream in their food cultures and microwavable frozen foods are frequently seen on the table. However, as health consciousness continues to rise, rice has attracted attention for being gluten-free, and the demand for rice is on an increasing trend in the restaurant industry. UNESCO also added Japanese culinary to the list of World’s Intangible Cultural Heritage . Cooking rice, on the other hand, has remained unfamiliar in the western countries and it is an important task how the rice culture should be promoted in ordinary household. Based on these backgrounds, Shinmei came up with an idea of microwaveable rice patties. With our rice procurement and quality-control capabilities and rice-polishing and cooking technologies built up over many years, we strive for expansion of rice-eating culture throughout the world. “Kome (Rice)” plays a central part of Japanese culinary culture. Shinmei Foods U.S.A. Corporation, based in Sacrament, CA, is actively developing overseas businesses with aim to introduce Japanese rice to the world. To enhance the food safety and quality control, Shinmei has implemented Burrtec’s “Burrcut Flex Door Sweeps” at the entrance of each workroom within their factory. Mr. Tsuyoshi Takuwa. VP, and Motoki Echigoya. Plant Manager of Shimnei Foods U.S.A. Corporation tell us why they have decided to implement “Burrcut Flex Door Sweeps” at their factory and how Burrcut has been utilized. HOW DID YOU DECIDE TO IMPLEMENT THE BURRCUT FLEX DOOR SWEEPS? We noticed that the doors at our plan did not quite fit during the construction and asked the installers to fix, but they refused to as the contract was only to install them. We got to know that Wooke Co., Ltd., our group company in Toyama, Japan, had used Burrtec’ brushes at their sites and became interested. When we met Mr. Suematsu, President of Burrtec, we were impressed to see him going into the production sites with his customers and demonstrating how to use Burrtec’s brushes himself so he could better understand his products’ physical and performance characteristics from the perspective of users. I think Burrtec’s strength lies in the subjective viewpoint toward their own original products, based on their strong sense of mission to contribute to the advancement of craftsmanship. It inspired us to try their products. ANY IMPROVEMENTS AFTER INSTALLING THE BURRCUT FLEX DOOR SWEEP? By placing Burrcut at the bottom of the doors, we could drastically prevent the intrusion of insects from outside. Air volume in the plant is adjusted so the air can flow in the direction of the outside and positive pressure inside the plant can be maintained for insect control. However, when the air intake and exhaust is not well-balanced or natural air intake is performed through the outer wall louver, large amount of air comes into the building through the door or gaps due to the negative pressure. Insects blown in with the air can end up causing contamination. We attached the Burrcut Flex Door Sweep etc. to the doors and outer wall to keep the room hermetic for insect protection. Orkin, a pest-control company, conducts a facility check every month, and it turns out that after Burrcut Flex Door Sweeps were installed, insect intrusion rate is 90% down over a previous year. Attaching Burrcut also made us realize there were areas where we did not even notice existed insects could come in from. 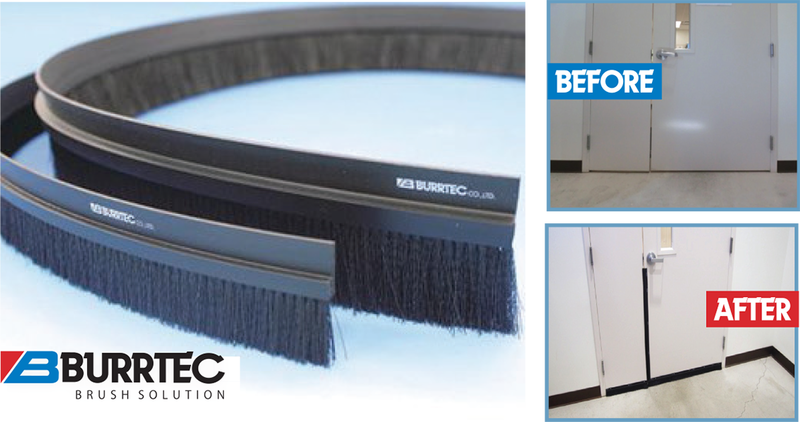 Our employees feel concerned and less motivated when bugs are found at the production site, but with Burrcut Flex Door Sweeps, they can feel safe. Burrcut is already an indispensable asset to us. WHAT DO YOU THINK ABOUT OUR CUSTOMER SUPPORT? We really appreciate Burrtec’s meticulous customer support system with the time difference between the US and Japan into consideration. They even sent a sample from Japan for us to try. Their sales personnel always remain a decent distance and are never pushy. They keep improving their products and are very knowledgeable. They are also friendly – they stop by just to say hi when they are in the US and are always willing to learn new things. Very impressive. TELL US ABOUT THE OUTLOOK OF SHINMEI FOODS U.S.A. CORPORATION. DO YOU HAVE ANY OTHER PRODUCTS YOU CONSIDER IMPLEMENTING? We are currently working on Kosher and Global Food Safety Initiative (GFSI) certificates to ensure our reliability as a provider of safe foods. Kosher, Jewish dietary regulations, is becoming rapidly recognized as genuine food in the global market due to its safety and high quality. Being a Kosher-certified company can lead to product differentiation and ultimately huge business opportunities. We also plan to acquire FSSC22000, SQF codes, and BRC recognized by GFSI. These GFSl-recognized schemes are essential for food suppliers as consumers are increasingly aware of food safety. In order for us to accelerate the certification process, we’re thinking about implementing Burrtec’s Burrat Samurai Armor Door Sweeps as well. WOULD YOU RECOMMEND BURRTEC’S PRODUCTS TO ANY OTHER CORPORATES? WHAT WOULD YOU EXPECT FROM BURRTEC MOVING FORWARD? We believe Burrtec’s best strength is that all employees see things from the standpoint of users. Burrtec has a very clear product definition as “contribution to the advancement of craftsmanship.” We believe that Burrtec fully understand the pre-defined management resources and explore new markets not only in the US but the entire world without sacrificing their existing market. Thank you, Mr. Takuwa and Mr. Echigoya, for your time for the interview. We’d like to offer the best products possible while strengthening a trustworthy relationship with your company. We promise that we’ll do our best to help your employees feel happy and comfortable at the workplace with our products.